Handle With Care: An Unusual Butterfly Journey | What is ML Reading? 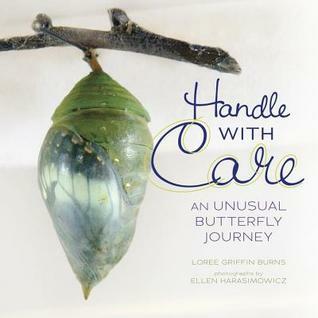 Handle With Care: An Unusual Butterfly Journey by Loree Griffin Burns and photographs by Ellen Harasimowicz mesmerized us. Curious how museums acquire butterflies for Butterfly House Exhibits? This is the book for you. One of my fondest memories of ML, when she was experiencing the first adolescence, (aka as age three). A visit to the Butterfly House at the Museum of Life and Sciences in Durham, NC. Well, until she threw the biggest temper tantrum she’s ever thrown. All because we had to leave. You can ask my cousin Ashlee about it. She was there and wasn’t a mother yet. Thankfully, it didn’t deter her from motherhood. Ashlee’s daughter is almost three. Pretty certain she can relate now. This entry was posted in Nonfiction Book and tagged Ellen Harasimowicz, Handle With Care: An Unusual Butterfly Adventure, Loree Griffin Burns by mlreads. Bookmark the permalink.